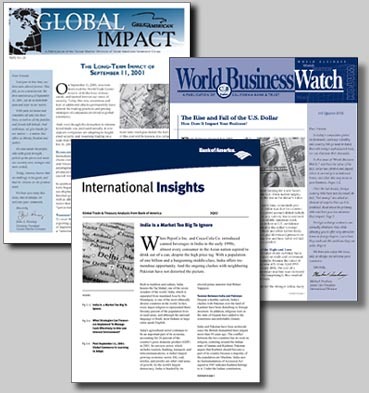 Our custom newsletters are designed to educate client audiences on international business, policy, finance and other issues while promoting the clients products, services and message. Each article provides sound analysis and useful information readers can use to seize opportunities and mitigate risks. Plus, our reader-friendly writing style simplifies complex subjects and our attractive format keeps the reader's attention. Each issue enhances customer relationships while creating a positive selling environment. And the publications pay for themselves in both increased cross-sell and overall customer retention. Our custom-tailored newsletters position each client as a leader in its industry and generate optimal positive exposure.